Objective: Use head protection to prevent injuries. Explain the information below on when and where to wear a hard hat. Show workers how to inspect a hard hat for safety. Demonstrate a proper hard hat fit. Have each worker try on and adjust a hard hat to proper fit. Wear hard hats made of slow-burning, water-resistant molded plastic. They protect the head in various ways. The hard outer shells resist blows and penetration from above. Shock-absorbing suspensions (headband and straps) act as an impact barrier between the hat and the head. Slow-burning materials protect against fires and electrical burns. Water-resistant materials provide insulation from electrical hazards. 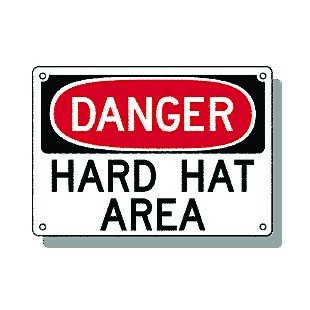 Hard hats come in different classes with different levels of protection. A Resists impact and penetration. Provides limited resistance to electricity. B Resists impact and penetration. Provides high resistance to electricity. C Resists impact and penetration only. Provides no resistance to electricity. Usually made of aluminum. Do not wear around electricity. Wearing a hard hat helmet over a cap or parka hood defeats the suspensions. Instead, use a liner to keep the head warm. Chin straps are also available to keep the hat in place. the headband is not stretched or worn. the shell is not dented, cracked, or visibly damaged. Check the hat for damage after use. If the hat is damaged, destroy it. Wash the shell frequently using hot soapy water only; rinse thoroughly. Store the hat carefully in a cool, dark, dry place. Know when to wear a hard hat. Choose the best hard hat for the job. Wear hard hats that are in good repair.